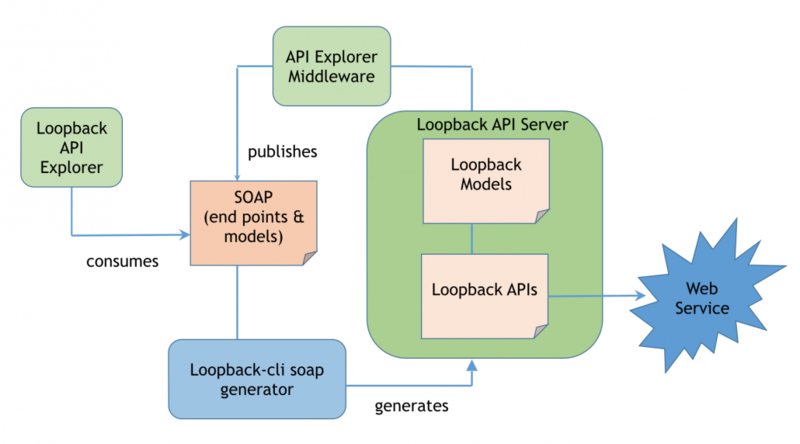 We are excited to announce that LoopBack can now generate remote methods and REST APIs for SOAP web services. This feature enables you to easily create REST APIs that invoke web services without having in-depth knowledge of the web service. SOAP has been an industry standard for a long time, and enterprise adoption of REST APIS means supporting legacy systems. What are Web Services, SOAP, and WSDL? Web services enable applications to communicate with each other independently of their platform and language in which they’re implemented. A web service is a software interface that describes operations that can be invoked over the network through standardized XML messaging using Simple Object Access Protocol ( SOAP). Web Services Description Language ( WSDL) is an XML document that describes web service endpoints, bindings, operations, and schema. SOAP web services are still important in many enterprises. However, SOAP is fairly heavy-weight, and working with XML-based SOAP payloads in Node.js is not easy. It’s much easier to use JSON and to wrap or mediate a SOAP service and expose it as a REST API. To support the “API design first” approach, the SOAP generator (lb soap command) creates LoopBack models and REST APIs for WSDL/SOAP operations to enable you to create a LoopBack app that invokes a web service without writing any code. npm install -g loopback-cli For more information, see Installation (LoopBack documentation). Select 3.x or 2.x LoopBack version. When prompted ‘What kind of application do you have in mind?’, select ‘empty-server’’. Here are the steps to create SOAP Web Services datasource for periodic table web service. Enter the data source name, ‘periodicSoapDS’. Scroll through and select ‘Soap Webservices (supported by StrongLoop)’ from the list of connectors. Enter http://www.webservicex.net/periodictable.asmxfor ‘URL to the SOAP web service endpoint’ prompt. Enter http://www.webservicex.net/periodictable.asmx?WSDL for ‘HTTP URL or local fie system path to WSDL file’ prompt. Enter ‘Y’ to Expose operations as REST APIs. Press RETURN when prompted to ‘Maps WSDL binding operations to Node.js methods’. 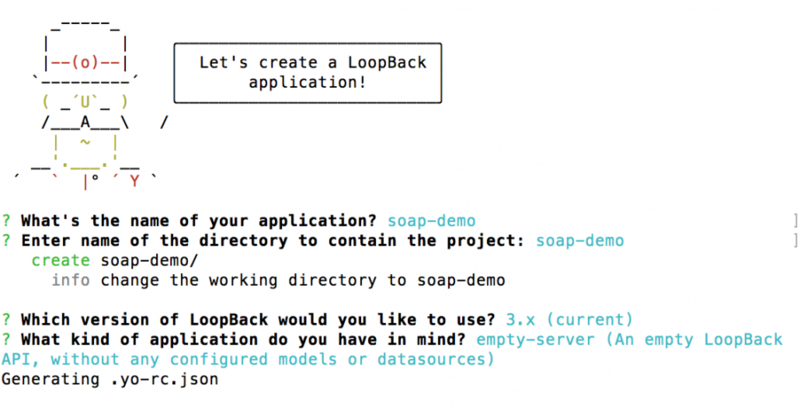 Select ‘Y’ to ‘Install ‘loopback-connector-soap’ prompt. This installs loopback-connector-soap, required for the lb soap command to work. Refer to SOAP data source properties for more information on SOAP data source properties. Now generate models and APIs from the SOAP web services datasource. This prompts you for list of SOAP web service data sources you have created for this app. Now it will just show ‘periodicSoapDS’ since that’s the only one created so far. Select the data source from the list. The generator then discovers all the services defined in the WSDL for the selected datasource. Select the service from a list of services. Once you select a service, the tool discovers and lists bindings defined for the selected service. Once you select a binding, the tool discovers and lists SOAP operations defined in the selected binding. Once you select one or more operations, the tool generates remote methods and a REST API to invoke the web service at http://www.webservicex.net/periodictable.asmx. 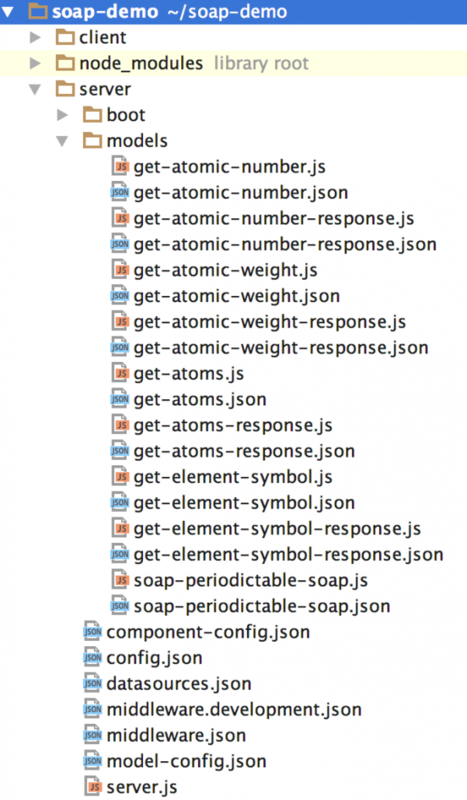 soap-periodictable-soap.js: JS file containing all APIs which can invoke Web Service operations. As you see, SOAP operations defined in the WSDL document are now available from LoopBack! This invokes the REST API generated in soap-periodictable-soap.js. This REST API in turn invokes the periodic table web service at http://www.webservicex.net/periodictable.asmx returning a SOAP result back to the API explorer. Start with a SOAP web service data source. Generate corresponding models and APIs to invoke SOAP operations. 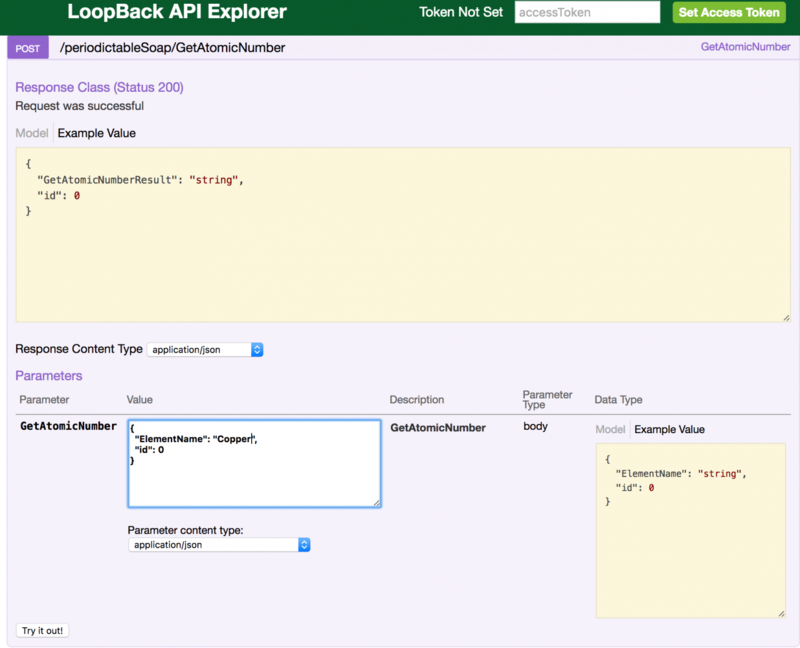 Play with the live APIs served by LoopBack using the explorer. Code for this feature is mainly in these repositories:loopback-cli generator-loopback loopback-soap strong-soap Now that you know how to generate APIs and models for SOAP, please feel free to use it in your apps, open issues, submit pull requests, and continue to help make LoopBack a great community. Contact the LoopBack team on GitHub directly (for example: @rashmihunt for me, @strongloop/loopback-dev for the entire team) if you have any questions or requests.